With aggressive cleats and tread, STABILicers Lite snow and ice cleats by 32north (also known as Stableicers and Stable Icers) provide unbeatable traction in snow and ice. Made from the same elastomer as the STABILicers SPORT, the Lite is easy to pull on and take off, while securely fitting both shoes and boots. STABILicers Lite's non-replaceable multidirectional steel cleats bite into ice and snow allowing you to stride naturally through winter's worse conditions. This product is ideal for walking, jogging, and light running or light trail hiking. When you don't need the heavy durability of the original STABILicers or the grip of the STABILicers SPORT for daily runs or rigorous hikes, the STABILicers Lite is just what you need. NOTE: If you intend to wear this product over boots or oversized footwear, we recommend purchasing the next larger size if you are at the upper end of your normal size or are in between sizes. Boots NOT included. Not designed for technical climbing. Heel and forefoot cleats: Full foot slip protection with heel and forefoot cleats maintains traction throughout your natural stride while walking. Permiter attachment system: Offers easy on/off design while securely fitting virtually any style footwear. Proprietary elastomer: Lightweight TPE Elastomer holds STABILicers Lite securely in place, while providing superior durability and memory. Dual Traction System: Traction tread outsole and cleats simultaneously contact walking surface, providing superior grip on ice, snow, rock, and pavement. 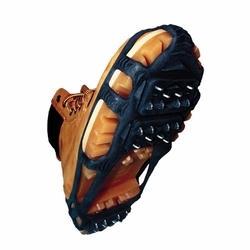 Steel multidirectional cleats: Multidirectional, case-hardened non-replaceable cleats bite into ice and snow.